There are hundreds of religious colleges across the country, but some students wonder if they can get financial aid at a Christian college. Though the federal government does believe in a separation between church and state, you can still get federal money to pay for your higher education. Many colleges offer financial aid packages, and some colleges also offer private loans and other types of aid that can help students pay for their educational needs. The Free Application for Federal Student Aid (FAFSA) is an application that students complete prior to beginning their classes. The government will look at the income of your parents to determine the type of aid available to you. If you are an emancipated minor or meet other requirements, the agency will look at your own income instead of your parents’ income. According to the FAFSA, all applicants must be an American citizen, have a social security number and be free of drug convictions to qualify. Taking courses at an approved school or receiving acceptance to a school is another requirement. To get financial aid at a Christian college, you need to understand the difference between a grant and a loan. A grant is money that you receive for college that you do not need to pay back later. Most students qualify for only a small amount of grant money but a larger amount of loans, which you will need to pay back after graduation. 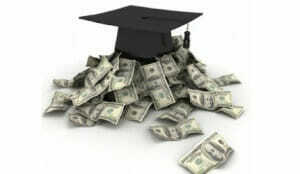 Students usually begin paying back their loans within six months after graduating or leaving school. Even if you do not complete your degree, you’ll still need to pay back loans. Christian colleges and organizations offer additional types of funds for college students, including scholarships, work study programs and private or alternative loans. Private and alternative loans are available to those with a good credit history and their families. You can often borrow more money than you could from the government, and these loans are available to those going to school part time. A large number of scholarships are available to those going to Christian and religious schools. You often need to write an essay about why religion matters to you or another similar topic. Work study programs are another option. You agree to work on campus in the alumni center, as a telephone representative, in housekeeping or another area, and the school will pay you minimum wage or slightly more. Before you can get financial aid at a Christian college, you need to apply for that aid. The FAFSA is now available online, but you will need a copy of your parents’ latest tax return. After setting up an account, you receive a pin code that lets you access your account at anytime. You need to answer a series of questions about the school you attend or the schools you applied to, your current contact information and other questions. You’ll receive notice about the type of financial aid you qualify for within a few weeks. Christian colleges believe in providing students with a strong religious foundation that they can use after leaving school. Student loans, grants and scholarships are a few types of financial aid open to those students, but to get financial aid at a Christian college, you need to fill out the FAFSA first.